One of my guilty pleasures is the mobile game Pokemon GO. It helps to pass the time when I travel for work, and when I'm home it gives me a reason to get up and get out of the house. I've visited a lot of neat places thanks to the game, looking for new Pokemon to catch. Recently I decided to pair my digital collection with a physical one, and collect a trading card of each Pokemon I've caught in the game. 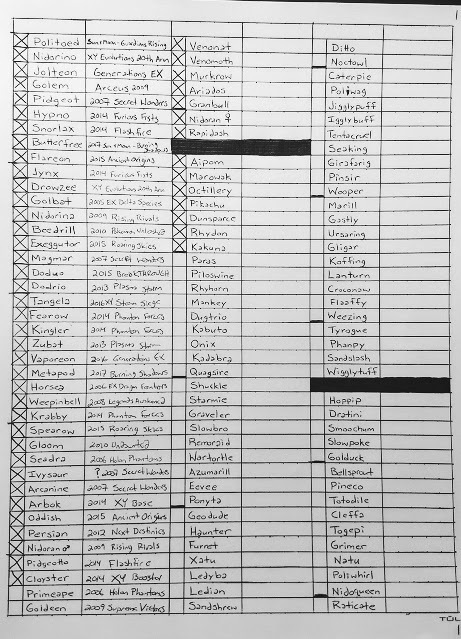 I went into my digital collection and sorted by date caught, then wrote out the list in order. When I catch or evolve something new, I add it to the end of the list. So far I've got almost three card pages filled with Pokemon cards, mostly ordered through COMC. My method is pretty simple. I focus on foil cards, and select the card with the art I like the most. So far I've been able to get a lot of the cards for a dollar or less apiece, although that Jolteon EX in the upper right cost me $5 on eBay. 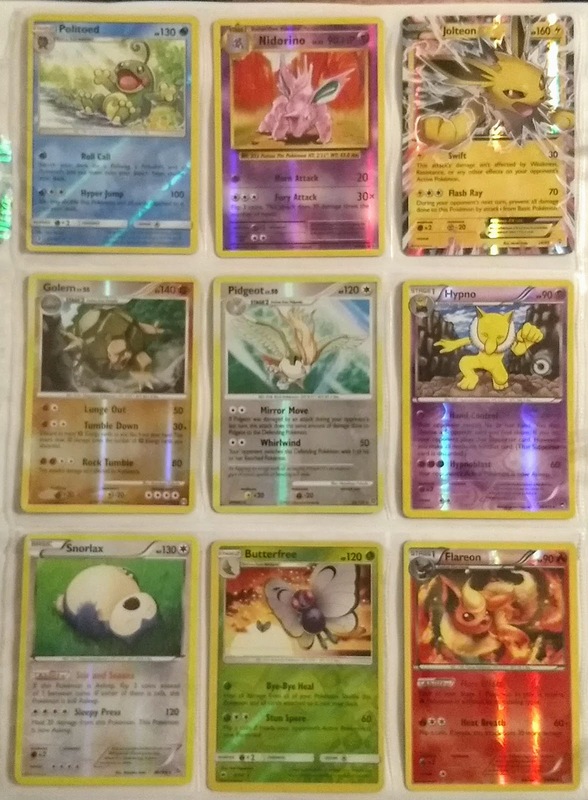 My favorite card on this second page is probably Golbat, although I also like the Doduo card a lot. My collection is not particularly valuable, but it's fun to have a physical representation of my collection. There are also memories associated with some of the Pokemon. I caught my first Jynx in the parking lot of a Burger King in July of 2016, during one of the resident courses required for my current job. The Pokemon experts in my readership might note that many of these early Pokemon are evolutions of other more common Pokemon. That's probably because I evolved the lower-level Pokemon in-game after catching them. I wasn't sure if I should precede each of those cards with the basic Pokemon, but decided that it made sense for my longest-tenured critters to evolve as they traveled with me. That's my story, at least. If I had a way to go back and look at my log in greater detail, I would probably go in strict order, but this is the best I've got. So far I have around 280 different Pokemon on my list, so there is plenty of collecting to catch up on. 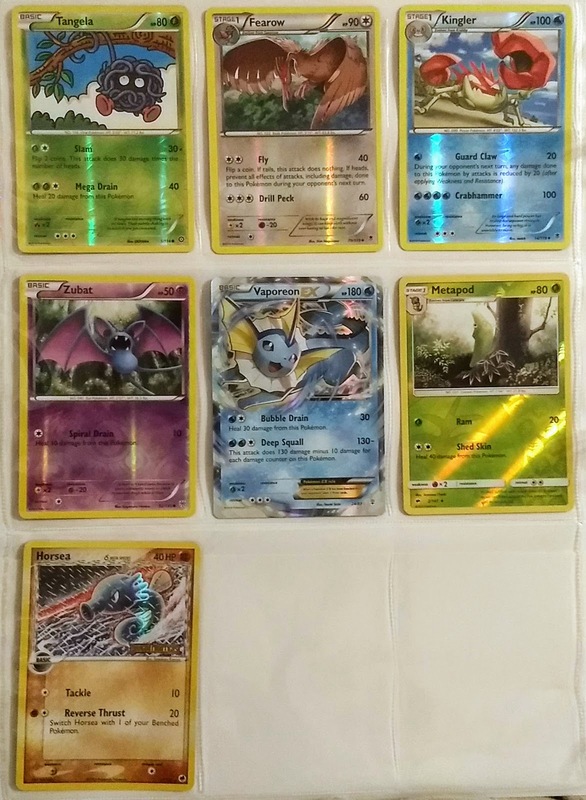 It was fun to search out these first few pages of cards, and it is a relatively cheap collection to add to, as long as I don't seek out the really rare or old cards. Here is the first page of my checklist. 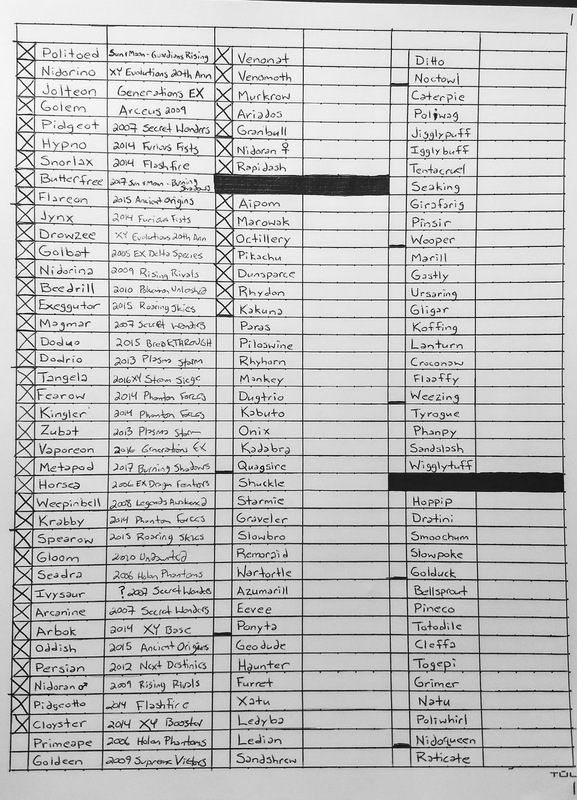 It would probably be easier to build the list on a spreadsheet program, which would allow for more information and better sorting capabilities, but some lists need to be written out on paper. This looks like a list I might have written up as a kid, when Excel wasn't something I dealt with. You can see that I've checked off about 6 pages worth of cards, but those last few pages haven't shipped yet. I couldn't find the cards I wanted on COMC for Primeape and Goldeen, but I know which ones I want. Cool project. I never played the game (card or app), but Pokemon helped me supplement my income my first year of teaching. I'd sell packs and singles to kids. 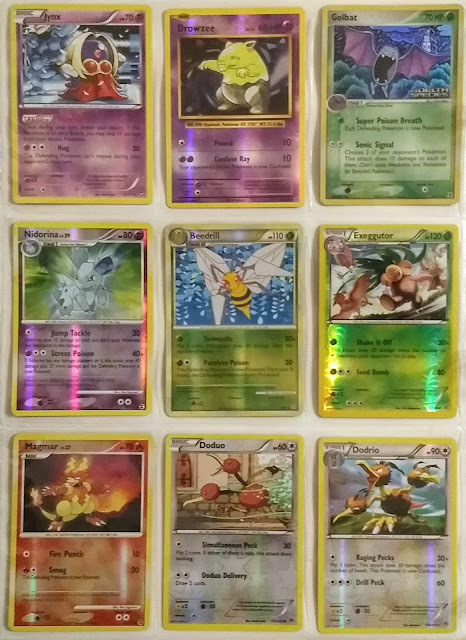 At one point, I had complete sets of Base, Jungle, and Fossil. These days, I still have a few cards sitting in a box somewhere. I played the card game a few times, but I enjoy collecting the cards more than playing. That's true of me and most collectible card games. Haha...nice work. My time working in an elementary school coincided with the height of Pokemon cards' popularity. Between the stacks left in my gym by forgetful third-grade boys, my own (now grown up) kids' cards and those I had to confiscate back then, I had quite a collection. Then as now I had no clue what they are all about. I was a hair too old to really be into the games when they came out, but I knew a fair bit about the story and concept. My kids have been watching every Pokemon show and movie they can find, so there is plenty of Pokemon knowledge to go around here. All three of my boys have taken up collecting the cards, so that gives us something to do together. My youngest loves playing GO on my wife's phone. He also collects the cards...somewhere. My kids' cards are scattered all around as well. I guess they inherited their hobby organizational skills from their dad! Haha, this is an awesome collection! It's a fun one to work on! I never got into Pokemon. Yugioh though. That was something I spent hundreds of hours playing with my friends. I could never get into that one. I imagine I would have to watch the show or something to figure out what's going on with it.